This intervention refers to acoustic pauses - tacets - in urban background noise, turning it into an unwritten score. 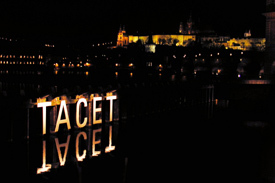 TACET works as a detector for silence: the flashing of the letters accentuates visually a moment of silence. Once the level of noise goes down, the characters light up. As an instruction to be quiet, TACET poses new questions: who should actually be quiet? TACET is aimed at someone non-present playing music: it is aimed at the collective producing noise, elements as well as living creatures in the immediate surrounding and broaches the issue of their struggling for acoustic supremacy of the spot.